I really had to focus this week to finish these new cloths. I've been so busy lately with the kids and housework that it's almost been impossible to find the time to knit, let alone design and write patterns. We're going through a Spring cleaning over here and I hope once I finish organizing my office next week I'll be able to figure out what I'm doing for the next few months. I hope I find all my lost needles as well! This pattern is available as a PDF download and priced at $3.25. There are eight cloth patterns in this set. You can purchase this pattern if you are a Ravelry member by clicking the "Buy Now" button below the pictures. 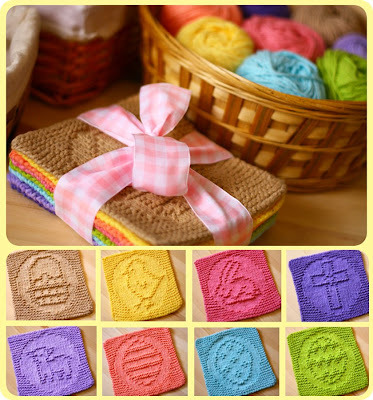 The Easter Cloths are also available in my Pattern Store here as a Ravelry Download. There are 5 pages total and the download is sized at 4.5MB. If you have any questions about the pattern or payment options, please feel free to contact me via email at KrisPatay4@yahoo.com or on Ravelry: KristenKnits. I keep finding things around the house that I've finished but never shown anyone. I'm sure there will be lots of posts this month as I slowly go through everything. I still have tons of yarn in boxes from the move last April! Some other news, I'm about halfway done writing up the pattern for the spring bag that is currently on my needles. I cannot wait to be able to offer it to you. Hoping everyone is well! I love these!! Thanks for sharing them and making them available for purchase!! These look great, and I'm looking forward to knitting some up. Can't wait to see your spring bag design. These are beautiful! I'll have to show my dd when she wakes up. She's enjoyed knitting your dishcloths so much! I have to ask though...where do you find such pretty colors of dishcloth cotton? We have had a hard time finding a nice selection. Do you by chance have a favorite on-line site you buy from? Oh my gosh, when is Easter? Do I have time to knit some of these up??? These are beautiful, I have them one of the eggs on my needles right now. Kris, you are a very talented young lady. The little chick is the one I am starting with on my sticks...so cute. Please make some Mother's Day cloths!! They are so cute, I especially love the colors you picked.